After display, all these examples can be customized via the tabs 'Calendar', 'Month', 'Boxes', 'Photo', 'Caption', located above the calendar. Click on vignette to diplay the calendar monthly 2020. 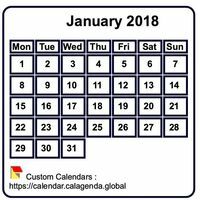 Calendar january 2020, agenda january 2020 detailed, format landscape. The numbers of week are diplayed (8). To change the size of boxes, click on the tab 'Boxes'. Calendar to be printed january 2020 virgin, format landscape. The numbers of week are not diplayed (8). Calendar diary bullet journal monthly in braided paper, with customizable colors. Calendar monthly 2020 to print with two photos of holiday. This calendar is particularly adapted to the realisation of a calendar of holiday, due to the fact that with two photos a month, you get an annual calendar with 24 photos. To replace the left photo, use the tab 'Photo '. To replace the photo above the calendar, use the tab 'Month' and change the photo of the background. This calendar uses function 'Stylesheet ' behind the tab 'Calendar '. Calendar monthly 2020 to print, horizontal with photo. This realisation shows a discreet calendar below (or above) of a photo. To replace the photo, use the tab 'Photo '. To put the photo under the calendar, choose 'Under The calendar' in the pop-up list 'Picture position'. This calendar will diplay a photograph of a doll Gorjuss different every month. The important margin in the top of the calendar allows a perforation to put 12 pages together, with an impression in format 10X15 or 13X18. To replace the photo, use the tab 'Month ' and change the photo of the background. This calendar uses function 'Style sheet' available behind the tab 'Calendar '. 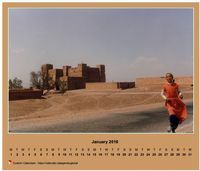 Calendar january 2020 of series 'Tubes women'. This calendar will diplay a different photo every month. Calendar to be printed monthly 2020 virgin, format portrait. Calendar monthly 2020 with notes. This calendar 2020 will find his place easily in a kitchen, to register there manually at the same time appointments of each day and monthly notes. He uses the available style sheet (11) behind the tab 'Calendar ', to define the design of the monthly notes. To write in notes before printing, it is enough to position the mouse in the zone of notes, to grab the text directly, then click on 'Save'. Weeks numbers are diplayed (8). Calendar monthly 2020 nursery school and primary. 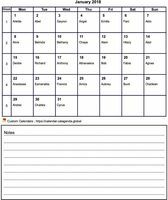 This calendar is intended for the training of reading and of writing in nursery schools and primary. He uses the available style sheet (11) behind the tab 'Calendar ': the name of the months and of the days of the week is present at the same time in uppercase letter, in lower case, and in script ( Script MT Bold). You can use a police for example script introduces on your computer by changing this style sheet. This calendar monthly 2020 will be appreciated ongoing preparative of primary schools. He allows on one hand to learn to read and to write in uppercase letter, in lower case and in script the name of each of the months, on the other hand to register an event marking for each day. Calendar to print virgin monthly, with timetables in every box. Calendar to be colored january 2020. This coloring calendar will allow children to become familiar with the time: days, weeks, months, seasons and years. To change the picture to be colored of definite month, after display of the calendar, click on the tab 'Photos '. You can also diplay the numbers of week (8). 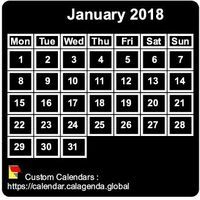 Calendar 2020 to print monthly, black background, tiny size, pocket size, special wallet. It is possible to change the color of boxes (3), and the background color (4). Calendar 2020 to print monthly, white background, tiny size, pocket size, special wallet. Calendar 2020 monthly, agenda 2020 monthly detailed, format portrait. If you want to print the calendar, adjust margins with the print preview of your navigator. Calendar 2020 virgin planning monthly, format portrait, 4 columns. This example of monthly calendar 2020 include 4 virgin columns, for example a column for each member of the family, or for each daily activity, or for every instant of the day. 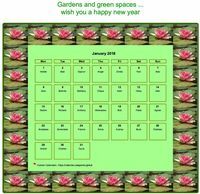 Template by default (9) of the calendar monthly 2020, table with photo. A photo (lake Titicaca in Peru) is present under the calendar (5). To change the height or the width of boxes, click on the tab 'Boxes'. Calendar to be printed monthly 2020 with photograph below. Name of saints (7), and numbers of week (8) are diplayed. It is possible to add a legend (6), to replace the photo, or to change transparency of the photo (5). Calendar to be printed monthly 2020 with photograph in underside. Numbers of week (8) are diplayed. It is possible to add a legend (6) and to replace the photo or to change her transparency (5). 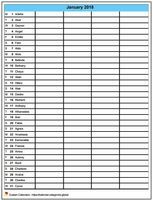 Template by default (9) of the calendar monthly in column. To change the height or the width of boxes, to click on the tab 'Boxes'. Calendar decorative agenda monthly, frame with motives waterlilies. A frame photo (5), and a legend (6) liven the calendar up. To regulate transparency of the photo, click on the tab 'Photo '. Calendar 2020 to print monthly, style 3D. This calendar 3D uses function 'Style sheet' available behind the tab 'Calendar ' (11). A rotation, an incline and a shade allow to obtain this result. 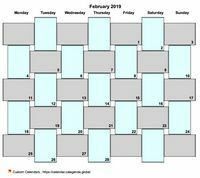 The choice of a background color for the calendar and for each of the boxes will bring desired design by every internaut. Calendar 2020 monthly in spirals. This calendar uses function 'Style sheet' available behind the tab 'Calendar' (11). 3D effect is got firstly with spirals, on the other hand with incline of the calendar and shade. Calendar 2020 monthly with a different photo every month. To replace the photo favourably with a family photo, to click on the tab 'Photo '. Every internaut will be able to customise the color of the border and of the background with tabs 'Calendar ', and 'Boxes '. Calendar 2020 january of series 'Cats '. Calendar january 2020 of series 'Dogs '. This calendar, which will enrapture the lovers of the dogs, will diplay a different photo every month. You can replace the photo offered by default with the tab 'Photo ': Choose for example the nicest photo of your dog on the web, on your hard disk or your portable. The tabs 'Calendar', 'Month', 'Boxes', 'Data', 'Photos', and 'Caption' present above each calendar offer multiple possibilities. To change the color of the boxes (every day or a specific day of the week, for example Saturday or Sunday), click on the 'Boxes' tab. To change the background color of the 2020 monthly calendar, click on the 'Calendar' tab. To place a photo, replace it, size it or position it on the calendar, use the 'Photo' tab. You can use a photo of this site (royalty free photos), a photo of another site (check the rights of use), or a personal photograph (link Yours). 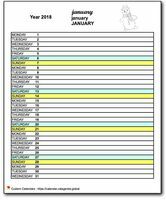 To add or edit a caption, first click the 'Caption' tab, enter or edit the text, choose a font, font size, color, and so on, then click 'Save and View'..
To display or not display the names of saints in the 2020 monthly calendar, click on the 'Data' tab. You can even display two, three, or four saints a day. To display or not display week numbers, click on the 'Boxes' tab. 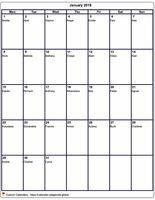 Each sample 2020 monthly calendar proposed above is built from a template. All calendar templates are customizable. To save your custom calendar, click on the floppy disk just above the calendar, check the model to save, click 'Save', then 'Selected above templates'. For reuse on another computer or browser, click 'Export', then 'Selected above templates'. The tab 'Calendar' contains a zone for entering a style sheet to make free calendars as you dream!